Tangy, sweet and spicy, this one-pan wonder makes after-dinner clean-up a breeze. Preheat oven to 400°F. 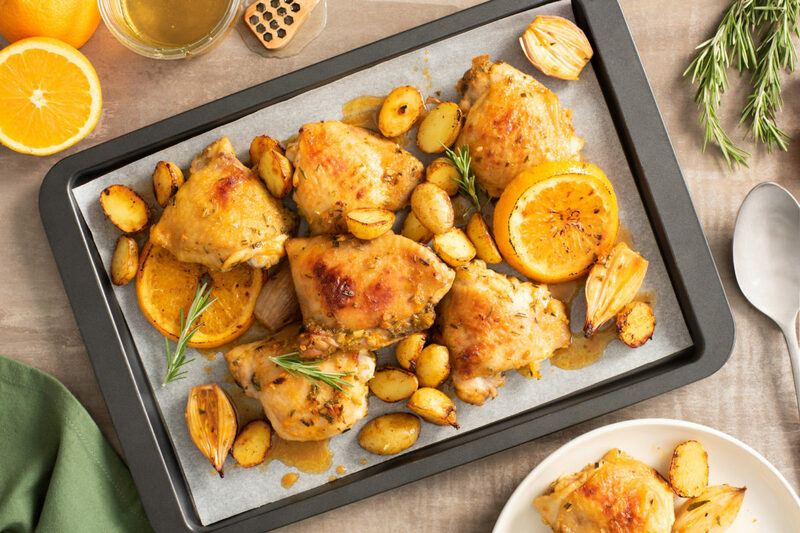 In large bowl, stir together orange zest, orange juice, honey, chicken base, hot sauce, rosemary, vinegar, olive oil and garlic; add chicken thighs, potatoes, orange rounds and shallots, tossing to coat. Arrange in single layer on parchment paper–lined baking sheet. Drizzle any remaining marinade over top. Bake for 35 to 40 minutes or until potatoes are tender and internal temperature of chicken reaches 165°F on instant-read thermometer.